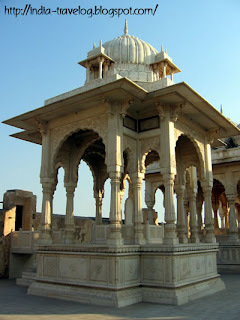 Devi Kund is located around 9 kms from Bikaner and houses the "Cenotaphs" the royal family of Bikaner. A cenotaph is a monument erected in honor of a person or group of persons whose mortal remains are elsewhere. 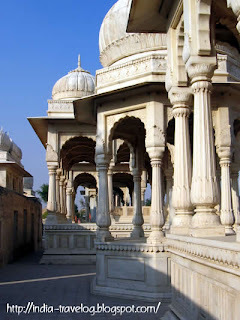 The cenotpahs or "Chatris" as they are called in Hindi are built in traditional Rajput architectural style. Some have been made of marble while are some of a red stone. 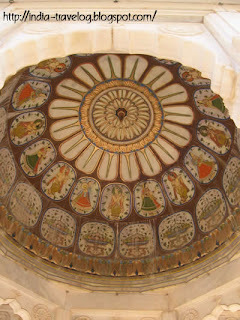 The cenotaph of Raja Surat Singh has been built entirely of marble and has exquisite Rajput paintings adorning the ceiling. According to the information available at Devi Kund, the Cenotaph of a male has a vertical memorial slab, while that of a lady has foot marks engraved on a slab. 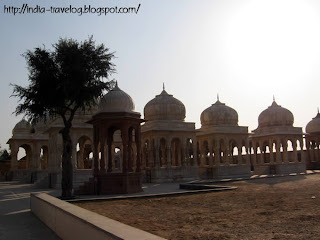 The Cenotaphs built for minors are called "Nada" and are simple structures without canopy. There is a small cavity on the platform in which milk and water is poured. We also saw some cenotaphs for stillborn children. 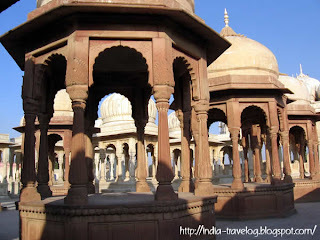 Most of the Cenotaphs are in old architectural style but a few later ones are in modern styles. 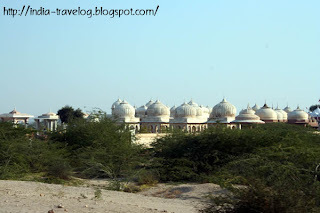 One among these new ones was that of His Highness Karni Singh, the 23rd ruler of Bikaner. 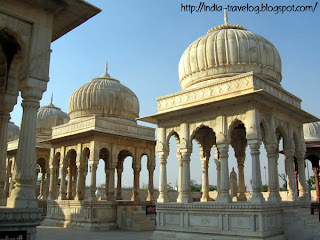 You can take the local buses from Bikaner or hire an auto as we did.